Includes site plans and perspective sketches of the Village at each Phase. - Sisters of the Road Café, Inc.
- Northwest Classic Falcons, Inc.
A Look at Dome Village, a detailed description of how at tent city in Los Angeles developed into a stable, permanent resource for homeless residents. At a May 16, 2001 meeting with staff from City Commissioner Eric Sten's office and the Bureau of Housing and Community Development, Dignity Village representatives presented a letter of concern to City Commissioner Eric Sten about their current situation (see Appendix B). In response, city officials asked the Dignity contingent to assemble a comprehensive outline for "taking Dignity to its next level of development." This is a working document prepared in response to that request, developed over several weeks, which will continue to be further developed over time. We feel the innovative collaboration outlined here represents a truly win/win strategy that, given a chance, will provide important benefits both to homeless residents and to the City of Portland. Dignity Village has evolved and thrived over the past 6 months due in large part to its uniquely organic process. In this manner, we have efficiently implemented programs (such as the self-management structure and cooperative farm) that more rigid organizations might have taken years to get off the ground. This creative energy, motivated by basic human needs for shelter, food and water, is a key ingredient to our success thus far. As we plan for the future, it is imperative to retain this organic organizational dynamic, in order to insure that such creativity is allowed to flourish into the future. Any organization - including Dignity Village - requires a structure, a clear vision, and detailed plans in order to navigate confidently into the future. This proposal assembles the shared ideas and dreams of our current residents and supporters into an organized planning document. In preparing this document, particular attention is given to addressing the kinds of "due diligence" issues that the City of Portland routinely poses to emerging organizations or new programs. Beyond such basic threshold requirements, however, this also provides narrative, site design, architectural, social and organizational components reflecting what Dignity Village has already achieved and can become in the future. A self-governed tent-village model has a number of advantages for everyone, particularly for homeless people, but also for taxpayers and businesses. In Portland, unless and until a homeless person becomes conventionally housed, there are basically only two options: (1) stay at a relatively conventional shelter (with curfews, early a.m. wakeups, close quarters, lack of privacy, lack of provisions for pets or couples to stay together, etc. ), or (2) push a shopping cart around with your belongings all day and sleep in doorways or under bridges at night to be subject to harassment by police or be victimized by street thugs. To many homeless people, for whatever reasons, neither of these options is experienced as very attractive or helpful. The Dignity Village model is not without precedent. On the West Coast alone, at least two other tent cities have moved to more advanced stages of development. A community very similar to Dignity Village took root in Seattle, where it served as the impetus for the creation of a new non-profit that has since developed 20 self-managed properties (see attached article, Appendix E, and <www.lihi.org>). 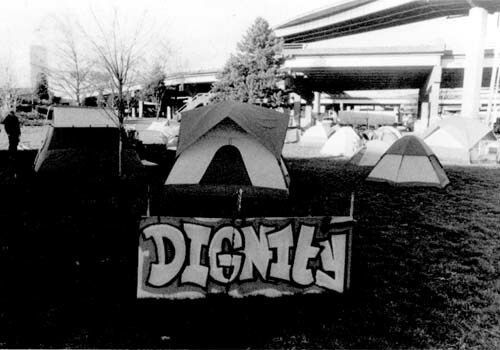 In 1993 in LA, homeless people organized DomeVillage/JusticeVille in the heart of downtown, where over 20 Omni-Sphere domes have been constructed to provide housing and supportive service for homeless individuals and family members (see attached detailed booklet in the Appendix, and <www.justiceville.org>). At Dignity Village, we aspire to even higher levels of economic self-sufficiency, self-governance and sustainability. This is made possible by avoiding expensive cumbersome administrative structures and by minimizing costs associated with construction or renovation of conventional buildings. We request the continued cooperation of the City of Portland in order to meet this goal. Dignity functions as a dynamic self-help environment that provides a participatory framework for supporting each other, while simultaneously encouraging individual residents to more effectively help themselves at a personal level. This occurs through involvement that builds community among the people going through the process together. As the Villagers build themselves as a community, they will also build the physical Village as a reflection of their collective process with one another. This will enable them to move through the developmental phases in a way that reflects a profound awareness of the importance and value of civic participation. As a transitional mechanism, Villagers will not only become able to stand on their own feet out in the world; they will also be making a substantial contribution to their larger social context, illustrating to others how to build community, having developed a place for their own community that is highly livable and sustainable. Dignity is poised to become a unique prototype for synergistically addressing two critical social issues at once - homelessness and sustainable "green" development - issues that are normally addressed quite separately. Through a hands-on process of involvement, Dignity will enable Government agencies, social service providers, educational institutions, and private citizens to exchange knowledge and resources directly in a context of learning and teaching that will produce social and environmental benefits for the whole society. From a "green building" perspective, homeless people who have internalized a strong vision for creating a sustainable live/work environment are ideally situated to demonstrate to the larger, more conventionally-housed, community how much can be accomplished using very little in terms of material wealth or resources. Somewhat ironically, this is true precisely because homeless people have already been conditioned –albeit through unfortunate necessity – to make the best use of the very limited resources at their disposal. The optimal size for Dignity Village would be a minimum of 50 and a maximum of 80 residents on 2-1/2 to 4 acres of land. This scale of operation is small enough to maintain a strong system of self-governance without becoming organizationally unwieldy. At the same time it is large enough to provide the necessary critical mass of skills (from individual residents) needed, both to handle the internal operational tasks "in-house" (such as intake, cooking, construction, security, maintenance, landscaping, site development, trash and sanitation, and internal communications), and to continue to develop micro-enterprise ventures (such as the existing farm and the projected recycling enterprise) which will allow the Village to become increasingly self-reliant financially. At a meeting facilitated by professional architects, Dignity Village residents brainstormed an exciting list of design elements for inclusion in a vision for a more permanent Village. Many suggestions have been incorporated into the draft site plans for the Village (Section V. of this proposal). Almost all of these suggestions could be implemented at nominal cost and with a large proportion of donated materials. However, it will not be practical to put most of these ideas into practice until Dignity Village has a site to call home for at least a couple years. The following table provides a bare-bones summary of each Phase. Greater detail on the evolution of the Village’s design, physical composition, and governance is provided in the next few pages. Nomadic. Staying at each site for a few months before moving on. Implement self-governance systems described in Section VII. We see our community continuing to develop, building upon the significant accomplishments that have already been achieved to date. Until we obtain site control of a suitable parcel of land, we will attempt to make arrangements with private or public land owners for short term (three months minimum) hosting of Dignity Village. In this manner, we will keep the Village alive, albeit vulnerable, until we identify a more permanent location. Developed a functional solar shower out of recycled materials, and incorporated recycling into the trash and sanitation systems, reflecting both commitment and innovative capacity regarding sustainability issues. Created a self-governance process that restores the dignity and self-worth of village residents. Developed and enforced written Dignity Village membership requirements and rules of occupancy, including 1) keeping the site drug and alcohol free, 2) no stealing, 3) no violence to self or others, and 4) making a fair contribution to the over-all functioning of the village. Established a farming enterprise near Vancouver, WA, where we just seeded 1-1/2 acres to provide fresh produce for Dignity Village residents, and to be sold at co-ops and farmers markets, providing a significant projected net return on the initial investment. Raised over $11,000 in private contributions, which is now being used as seed capital for cooperative enterprise development (such as the farm venture) and for the ongoing purchase of critical supplies, such as propane, buying the large meeting/kitchen tent, etc. Provided safe and sanitary shelter for 80 people for 5 months at no cost to the public purse. Provided peer-based transitional housing services to approximately 20 formerly homeless people, who are now housed because they used their stay at Dignity Village as a bridge to access existing affordable housing opportunities. To further develop this innovative model, it is essential to have a physical home that doesn't keep moving. Our critical next step is to obtain a suitable longer-term site on which to relocate by July 1, 2001. Although a permanent site would be ideal, we could start off with a 2 year renewable ground lease of land, including rights to set up water, electrical hook-ups, and portable/modular/mobile common area improvements (similar to yurts or domes) designed to be disassembled and relocated to any future site. Located close enough to the downtown core to be accessible and visible to the homeless population being served. Large enough to accommodate the size and scale noted above. The next phase of development will still maintain tents as primary individual residences, but will also include semipermanent improvements in common area spaces. The tents will be organized into circular 6-7 pods of 7-8 tents each. These will serve to define a smaller shared common area for each pod, providing a privacy buffer for each pod's residents to decorate as they see fit and where the pod also functions as a "cell group" for Village governance (see self-management section). As common areas, we plan to construct a kitchen, lockers, a covered meeting room, and a sanitation facility within the first six months. Sketches and budgets for this phase are attached. We would also use this time to further refine our organizational model, build relationships with other organizations that work in a compatible way with Portland's homeless residents, and plan our next steps. The Village will integrate itself within the city so as to be a contribution to the life of Portland, presenting a public face that will invigorate the life of adjoining streetscapes and public areas. Consistent with the structure of Dignity thus far, the Villagers will actively participate in the design and will literally build the phases of the Village through their own sweat-equity. The Public spaces will be designated, path and roadway infrastructure laid out, and the tent pods will be sited in anticipation of more permanent shared-housing structures to be built in Phase III. Before investing any further financial resources, natural resources, and substantial amounts of sweat equity to develop a more permanent village, we will need to acquire a more permanent site. If our initial site proves satisfactory for all parties, we would undoubtedly be inclined to purchase it and remain there. Otherwise, an alternate site that better meets everyone's needs would be identified and purchased. Although tents are very inexpensive and mobile, they do not represent an acceptable permanent type of housing for Dignity Village residents. During this ‘Development’ phase, Villagers will reduce their exposure to the weather by building umbrella roofs over groups of tents. They will also construct sculptural screen walls to reduce wind in the tent areas and provide an enhanced sense of personal space. The common area facilities will be expanded and similarly protected with umbrella roofs and screen walls. Parking will be added to the site for social service workers, visitors, and residents. Permanent utility connections will be installed, and public places (roads, paths, small bridges, the piazza…) will be constructed out of durable materials. All construction will be in accordance with fire and safety codes and the City of Portland's construction standards. At this stage of development, the Villagers become engaged in the actual construction of a permanent form to inhabit, which is a reflection of their unique participatory structure of decision making and involvement. This Village form will be designed to compliment the architecture of its' surroundings, and will include the same functions as already housed in the temporary structures. The public places and shared spaces will be completed. Tent pods will become self-built, permanent buildings with shared units. The site’s water system (waterways, ponds, and natural irrigation) will be completed. All pathways and roadways will be installed with semi-permeable surfaces. The Village will be a demonstration project for building communities from the ground up, that are responsible for their own solid and water waste, recycling, energy generation and conservation, and runoff. The ongoing process within the Village will include the maintenance and further development of the Village as people inhabit it over time. Strong emphasis will be placed on connecting the Village to its' surroundings, not cutting it off, and at the same time, it will have vital edges and gardens, porches, gateways, public places/spaces, that will offer a unique experience to visitors within the city. It will serve as a little "sibling" community that assists other communities by demonstrating how people with very few resources can work together to provide mutual and community-wide benefits. It should be understood that the advice and approval of governing agencies will be sought and secured for all aspects of the project. This includes the bureaus of fire, police, building, sanitation, water, environmental services and others that will shape the development of the project. The proposed plan for this site features a 12’ wide fire lane that extends from SW Market to Naito Parkway. The road will be improved with a base and paving that is sufficient to support the load of fire vehicles. While fire hydrants are located along Naito Parkway an additional hydrant will be installed onsite in the first phase of the project. Additional hydrants, as required for new building construction, will be added and the project develops. The fire lane may also be used by police but will be restricted to delivery use for the residents. It is intended that the site will be developed from the outset in general conformance with the plan that is attached. The plan proposes pathways that divide the area into sectors that are sized to accommodate tents, in the first phase, that are separated by a minimum of five feet from each other. Eventually permanent structures will be developed along these pathways. The pathways will be developed to allow access for those with disabilities. There are currently nine residents of Dignity Village who are confined to wheelchairs so accessibility will be a major focus of the development. During the initial phase of the development of the proposed site the village will rely on portable restrooms and shower facilities and a central cooking tent. The first building construction effort will be directed toward providing permanent restrooms and showers along with a central kitchen and dining area that can be easily maintained. Sewer and water service to the site will be sized and installed with a view to the ultimate development of the property. The proposed scheme envisions stormwater being intercepted by swales running the length of the site. Some of the water will be stored in cisterns for use on the gardens while the balance of storm runoff would be directed to an area at the lowest point on the site where it will be treated on-site in a constructed wetland system that is built and maintained by the residents. Any new building construction will be carried out in strict accordance with the Uniform Building Code, National Electrical Code, the Uniform fire Code and the Uniform Mechanical Code. It is intended that the residents, with supervision by those skilled in building construction, will take an active part in building the village. The buildings will be designed, with the full participation of the community, by design professionals who are conversant with code requirements. While the initial phase of the Village will be dependent on temporary electrical service, it is envisioned that the permanent structures can be models of energy independence. Water heating will be done, primarily, with solar. Photovoltaic panels will generate electricity with assistance from wind and other alternative sources of energy. Phase III and IV permanent building construction will include a room or rooms for emergency medical attention and an isolation room for those who may be ill. A positive feature of this site is the fact that it is not readily accessible from any point along its perimeter. The project plan will propose fencing as necessary to maintain a safe environment for the residents. Gateways will be prominently located and will be sized to allow emergency access. While fire issues will be addressed by Code requirements as the project develops, Phase II development continues the use of tents. Beside the use of fire lanes and tent separation the site will be furnished with fire extinguishers, prominently located on poles and the resident will be instructed in their use. To keep hard numbers on Village population that can be recorded and used to identify trends and needs among current and past residents. To facilitate community by helping Village residents know each other. To establish who the voting members are for both elections and Village decision making. Entry on this roll will be mandatory in order to stay in the Village. However, legal or birth names will not be required, nor will residents have to provide any form of ID for admission. Dignity Village photo ID cards will also be created in conjunction with the roll for Village security and community outreach purposes. A significant hardship of living on the street is the necessity of carrying key personal possessions everywhere. This constant encumbrance makes it extremely difficult to obtain employment, find shelter, and get necessary services. To address this issue, part of the mission of Dignity is to create a place where Villagers and their belongings can be safe and secure. To address this issue, a 24-hour security rotation is maintained to patrol the site, with an eye towards insuring the safety of persons and possessions. This security rotation is be made up of residents who volunteer time as their schedules allow. Village security has the basic responsibilities of greeting and logging all visitors, walking the perimeter and logging any suspicious activity, logging all incoming contributions, and monitoring and logging any police visits. A Village log is be maintained as a record of all activities and contributions. Each person who wishes to join the Village reads and fills out a Dignity Contract, or Admittance Agreement (see Appendix D). The prospective member is then interviewed by an authorized Village representative to ensure they are fully aware of the workings and rules of the Village. Provided the applicant is agreeable, they then sign the Admittance Agreement to document their agreement with the mission and rules of the Village. Children under the age of 18 will not be admitted without their legal parents. Underage people are referred to programs serving runaway/street youth, such as Harry's Mother and Willamette Bridge Programs. No drugs of alcohol on site. No violence toward yourself or others. Everyone contributes to keep Dignity clean and sanitary. Rule violation is logged and reported, including names of security and/or other witnesses to the incident and other relevant information. Those found to be in violation will be promptly reminded of the Admittance Agreement and given a set time to exit the Village with their belongings. If not out of the Village by that time, the police will be called to assist with the exit, based on trespass laws. The entire procedure will be logged and reported by security. All exits can be appealed to the Village Council. From among the voting members established on the Village Roll, coordinators are elected (by all voting residents) to positions that facilitate the day-to-day functioning of the Village. Currently, these positions include coordinators for trash and sanitation, recycling, tents and population, micro-enterprise development, and security; but other positions may be added in the future as needed to insure the smooth functioning of the Village. Field Coordinators are allowed to live in the Village indefinitely to act as a grounding and stabilizing influence upon a larger more fluid population. Field Coordinators will be eligible to serve on the Village Council, once formed, and participate in facilitating weekly Council meetings. A Village Council is to be formed in the near future to serve as a governing body that will vote on all proposals that concern the vision, mission and financial security of Dignity Village. The make-up of the Council will reflect the physical make up of the Village. It will include elected Field Representatives, Pod Delegates and possibly Sponsor/supporter Representatives (in either a voting or non-voting capacity – this is still currently under consideration). Each pod of residents will have a delegate seated on the Village Council. This Pod Delegate will be responsible for attending all Council meetings in order to effectively represent the consensus of opinions, concerns and proposed solutions being put forth by residents of their home Pod. Representatives of core sponsoring organizations and/or key individual supporters may also be designated to serve on the Village Council to provide a broader community perspective on Village issues, but this is an issue that is still under consideration by Villagers and Supporters. These sponsor seats would equal the number of Field Coordinator seats and have equal voting power. The Village Council will consist of all Pod Delegates, Field Coordinators and Sponsor seats (either voting or non-voting). They will hold weekly, public meetings where all decisions that concern the future of the Village will be proposed, discussed, and decided. Council meetings would be open for all Village residents in good standing to attend as non-voting observers/participants. As with any democratic self-management system, leadership responsibilities are intentionally "held lightly" and periodically rotated to insure that new leaders are constantly being identified, trained and cultivated. This is crucial for the governance system to be experienced by Villagers as being "open" to as much constructive participation as people are prepared to bring, and for the Village over time to keep integrity with it's own claims to being a self-governed community. At the same time, it is necessary for outsiders (including supporters, supporting organizations, municipal authorities, etc.) to know specifically which individuals are responsible for what, especially in cases of emergency. To accommodate this need, the current names and contact information of Field Coordinators and of core sponsoring organization(s) will be posted (noting key roles, such as security, trash and sanitation, etc.) on Village bulletin board in meeting area at the Village site. We realize that it is especially important for police, fire, building code officials, or other civic authorities to know who to contact in cases of emergency. To accommodate this need, a current list of current Field Representatives (along with cell phone number of Village) and names and contact information for sponsoring organizations will be provided to the Portland Fire and Police Departments, and will be available to any other municipal departments on request. This list will be updated with authorities on an as-needed basis by Field Coordinators and sponsoring organization. Like any housing development, there will be inevitable fluctuations in the number of Dignity Village residents over time. Some residents will move on to permanent housing; some will join the internal operations core group, some will rotate through to work at the farm in Clark County or the recycling venture, and some may relocate away from Portland. However, the combination of socio-economic forces and bad luck that push so many people into homelessness is not going away any time soon. So for the foreseeable future, especially given the popularity of this approach with homeless people themselves, there will undoubtedly continue to be people who will move into Dignity Village as vacancies occur. Street roots has provided a meeting facilitation training. In ways such as these, sponsoring and affiliate organizations will assist with establishing and maintaining processes for non-violent, democratic governance and conflict resolution. Currently, these partner organizations include street roots, City Repair Project, Sisters of the Road, and JOIN, each with records of meaningful, compassionate, and effective grassroots organizing. From this base, there will be continued coordinated outreach to other agencies and organizations to link additional services to Village residents, on an as-needed basis. This would likely involve regular visits from housing-related service providers, medical/dental professionals, the VA, meal providers, and so on. Resources, both those contributed by outside sources and those generated by Villagers, are carefully managed by the Village, and will be managed with greater structure as the Village solidifies and evolves. Resources the Village handles include food, water, donated building materials, portolets, recycling, tents, cash funds, and other resources. other social service agencies, and have devised systems of sharing their food where it is needed, such as at DigsVille Collective Farm. Future resource development includes developing a relationship with the Oregon Food Bank, and the coming harvests from DigsVille Farm. Water - Currently the Village has permission to collect drinking and washing water from an outside spigot at nearby Saint Patrick’s Church. Volunteers from the Village collect and transport water 4-5 times a day in five gallon jugs. In exchange for this generous sharing of resources, Villagers have cleaned the Church perimeter and done other chores that the Church and Villagers have identified. Water is managed and used communally. letter of support in Appendix). Portolets - Currently the Village owns three donated portolets that it pays to have serviced out of the Out of the Doorways bank account. The Village has held fundraisers to service these facilities, and will continue to develop them as a resource, including adding handicapped accessible facilities. The Field Coordinator of Trash and Sanitation oversees the management and upkeep of these facilities. Recycling - The Village has developed a can and bottle recycling program based on individual collection and outreach to local businesses who have given permission to the Village to collect their recycling. The Field Coordinator of Recycling oversees the management and upkeep of this resource, and the funds from the program go to buy necessities such as fuel for the camp stove. Cash funds - When there is inadequate opportunity to gain a necessary resource through donations or barter, the Village collectively votes to allocate funds from the Out of the Doorways bank account, managed by street roots. This fund is replenished with generous donations, and through the fundraising efforts of the Village, such as the Dignity Fast held this past February and a recent $5,700 contribution from the War Tax Resisters League. Other resources - Other resources, such as donated clothing and other goods, are managed by Village volunteers, and are collectively allocated. Extra bounty experienced by the Village is shared with the larger homeless community when the opportunity arises, such as the recent contribution of blankets to a local blanket drive sponsored by several local social service agencies. One of the missions of Dignity Village is to be as autonomous and financially self-supporting as possible. The Village has already made substantial progress in this direction. However, we recognize that, at least during the early stages of development, it will be necessary to maintain a set of key collaborative relationships with appropriate organizations to ensure that adequate technical support resources are available and that all due diligence requirements are met. The following table describes a division of roles and responsibilities between Dignity Village and its key partners that maintains a balance between the Village’s desire for autonomy and potential need for external support in this effort. Secure the resources (food, money, materials, labor…) necessary to live in a safe and sanitary manner. Dignity Village is carrying out its roles and responsibilities in its current form of democratic governance, which relies on regular meetings and democratic decision-making processes. In the longer term, should Dignity Village decide to become it's own independent organization, it would most likely assume the form of either a cooperative or a 501(c)(3) membership-based non-profit, as these organizational forms seem most consistent with Dignity's increasingly sophisticated culture of democratic self-governance. Performing due diligence and risk-management functions for the Village. Assist the Village in dealing with transition issues when members of the core leadership group come and go. Because of the central importance of the self-governance model to Dignity Village, the core support organization must have a system of values that is consistent with and supportive of the Dignity Village model. One possible candidate organization that fits this description would be Sisters of the Road. The work of this organization would require limited, but dedicated, staff resources. Dignity Village would be happy to work with an interested organization and their funders to make the case that such a position would be an extremely effective use of public and private foundation resources that go into Continuum of Care programs. Finally, there are likely to be other affiliated organizations whose roles would be to own the land on which Dignity Village is located, and/or to serve in a developer capacity. The purpose of this land-owner would be to ensure that, in the long term, the land continues to be used to provide basic shelter and access to services for extremely low-income residents. These owner and/or developer organizations should be non-profit groups that provide some representation for Village residents. Examples of logical organizations for these roles would be the Portland Community Land Trust (as owner), and Sustainable Communities Northwest (as developer), but any non-profit that has an institutional commitment to house Portland's homeless residents and is willing to own/develop land would be a candidate. It might be possible for the land-owner/developer to be the same organization(s) that provides core support services, but this would not necessarily need to be the case. Strong emphasis will be placed on connecting the Village to its surroundings, not cutting it off. It is important to the success of the Village that it be a good neighbor to those who live and work nearby. The Village will be fundamentally different in appearance and organization from other types of housing found in Portland. Although the Village will not look much like its immediate surroundings, we believe that it will be recognized as a positive addition to the neighborhood. As with any type of housing, the Village will include a range of spaces, from public to private. The Village will have vital edges and gardens, porches, gateways and public spaces that will offer a unique experience to immediate neighbors and visitors from other parts of the city. The public spaces within or abutting the Village will be comfortable spaces for visitors and residents to use and enjoy, while more private areas within the Village will be reserved for residents. At our current site, we have visited all immediate neighbors to discuss concerns or questions, and resolve any misunderstandings, about the Village's presence. Beyond that, we also offer to provide services such as cleaning or security to local businesses. For example, we do security checks at Jim's Towing and clean the parking lot at St. Patrick's Church. Also, our neighbors continue to report that acts of vandalism have decreased in the immediate neighborhood due to the presence of Dignity Village. Support letters appear in the Appendix section from the Church of St Patrick, Rose City Awning Company, Northwest Classic Falcons, Inc., Security Towing, and Premier Gear and Machine Works, all of which are businesses located near our current site in NW Portland. sensitize and educate them on issues surrounding homelessness and the vision of Dignity Village. As an organization, the Village will continue to establish and maintain close communications and a positive relationship with our new neighbors at any future location(s), wherever we end up locating. To this end, the Village will identify a resident representative who will serve as the primary contact person and liaison with neighbors. If requested, the Village will voluntarily work with neighbors to develop more formal Good Neighbor Agreements as well. Dignity Village residents, supporters and partner organizations bring a wealth of hands-on community development experience, experience working creatively with homeless issues, direct experience with being homeless, and a wide range of hands-on construction work skills. Since Dignity Village is a self-managed community, we draw substantially on the skills of the people who live here, working in close collaboration with a core group of supporters from the broader community. The following detailed information is provided to illustrate the depth, breadth and texture of the skill base and professional experience of the Dignity Village community. Supporters of Dignity Village bring a wide range of professional expertise and experience to this initiative, particularly related to community-based development and homelessness. The Site Acquisition and Development working group (responsible for drafting this document) includes several Dignity Village residents working closely with a team of development professionals providing pro bono design and development services; while a number of other supporters bring professional experience with homelessness on the domestic front. Still others provide international experience with disenfranchised indigenous populations abroad. Sandra Bolton - International communities research and development, self-directed studies of techniques for building community relationships. 10 months travelling and living abroad in eclectic communities and villages in Europe, Australia, Columbia and South America. Outreach and public relations specialist. John Paul Cupp - Dignity Village resident, and community organizer with emphasis on social justice, known for poetry and speech, and has also worked as construction worker, farm hand and janitor. Orion Isis Gray - Community activist, with degrees in community psychology, urban studies bringing 8 years direct experience with houseless people, including work at Sisters of the Road, Boxcar Bertha's and Visions In Action. John Hubbird - 15 years experience in non-profit management, neighborhood/people-based development, community organizing, project management, community land trusts (9 years as Executive Director of NEDCO, a Eugene CDC), and homelessness-related services and advocacy (at TPI and JOIN). Layla Iranshad - BA in Anthropology, including studies and research related to disenfranchised Haitian-dominican population in Dominican Republic. Currently employed Residential Advocate at Street Light youth shelter, and a long time volunteer and supporter of Dignity Village. Mark Lakeman - Co-director, Creative Vision, the City Repair Project. Overseeing and coordinating the development of community gathering places for place-based communities throughout neighborhoods in Portland. 10 years experience as project designer in corporate architecture, ZGF and GBD architects. Tim Merrill - Architect and President of Merrill Architects, PC, focusing for the past 29 years on over 25 affordable housing, special needs and homeless shelter projects (such as Otesha Place, Park Place Homeless Veteran's Housing, and Longbourne House), working with numerous non-profit housing developers in the Portland area. Ibrahim Mubarak - Dignity resident / field coordinator in charge of Tents and Population, serving as key advisor and liaison between development team and the Village, and representing Village perspective in meetings with City of Portland. Bryan Pollard - Grass roots organizer focused on homeless and disenfranchised populations, currently employed as Residential Advocate at Transition Projects, Inc. Currently is also Managing Editor at street roots, inc.
Eli Spevak - 7 years of experience in affordable housing development. Currently a Project Manager at the Housing Development Center and board member of the Portland Community Land Trust. Since the physical infrastructure of Dignity Village will be constructed in phases, two development budgets are being developed. The first (included here) covers the first level of investment in the Village, which would take place once a semi-permanent site is identified. Wherever possible, costs are covered by in-kind donations, sweat equity and volunteer labor. However, some cash expenses will inevitably be required. For instance, basic sanitation requirements will require a water service hook-up, and the Portland Water Bureau charges fixed fees to install meters that would need to be paid or waived by the City. Given the types of structures that will be used at Dignity Village and the commitments of materials (ReBuilding Center, etc.) and labor (resident/support skills) that have already been received, we believe that these budgets are reasonable for the development program and site design described in this proposal as Phase II. However, revisions to the budget will be necessary as the project design is refined, and additional resources will be necessary to grow the Village into Phases III and IV. Attached is an estimate of construction costs for Phase II "Settlement" of Dignity Village. This budget represents the costs associated with making the Dignity Village site into a safe, sanitary and livable home for 80 residents. Ideally, the parcel of land on which Phase II is developed would be available to become the ultimate home for Dignity Village. But in case it is only possible to secure a ~2 year commitment for the use of this "Settlement" site, some of the physical improvements would be designed so that they could eventually be moved to a different site, if necessary. This is a modest proposal for establishing a permanent presence for Dignity village. Future phases will make facilities more permanent, but this initial effort will allow the Village to stabilize and consolidate. A semi-permanent, sanitary kitchen facility, possibly a modular unit, centrally located on the site. Within the kitchen, food storage cabinets would be provided. A covered and at least partially enclosed dining area and community meeting room will be built. The total estimated cash cost for labor and materials is $140,814. Our conservative estimate for the value of donated labor and materials is $37,280. The total project cost would be roughly $178,000. Of this investment, $95,000 would be preserved if the site had to be relocated. The ‘sources of funds’ has not yet been projected. In addition to the in-kind donations described within the budget, we expect to raise funds for the cash expenses from foundations, individual donors, and public funders. Consistent with the Village’s philosophy and sustainability (environmental and economic), the model requires a minimum of operating funds to function. As with the development budget, several key costs are covered through in-kind donations. The initial operating budget is attached, and provides notes on key assumptions. The costs associated with the construction and management of Dignity Village are extremely low on a per-person basis. With a population of 80 residents, the total construction cost would be under $2,500 per person, and the operating costs would be under $250 per person per year. Even if the Village were faced with a short, 2-year lease on land and no guarantee for eventual ownership, this would be an extremely efficient use of public funds. Ideally, of course, it would be possible to follow up Phase II with a more permanent (but still very inexpensive) housing development.